Generate 'GP Locum A', 'GP Locum B' and 'GP Solo' in seconds! When you create an invoice for a practice, a completed GP Locum A form will automatically be added to your invoice where appropriate. They can both then be printed or emailed to the practice in one go. 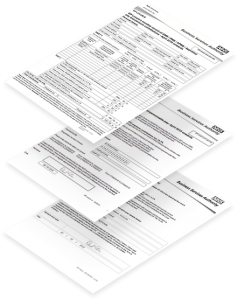 To generate a Locum Form B, simply select the month required. Locum Organiser will sum up all the invoices which have been paid in your selected month and create the form for you – with all the calculations performed according to your personal circumstances. All the necessary pension percentages etc. need only be specified once when you start, then you can forget about doing the calculations every month! If you need GP SOLO, we can do that too. If you’re a locum in Scotland or Northern Ireland, you’ll have different forms to those in England and Wales. Not a problem – just choose the appropriate scheme to use and Locum Organiser will use the correct forms and calculations. Our forms are always kept up to date as the pension schemes in each country change.